When I think of something being constructed out of gingerbread, I always think of a house. Although Rose took house building to the extreme with her made to scale Nôtre Dame Cathedral, in Rose’s Christmas Cookies, with 10 pages of architectural drawings. 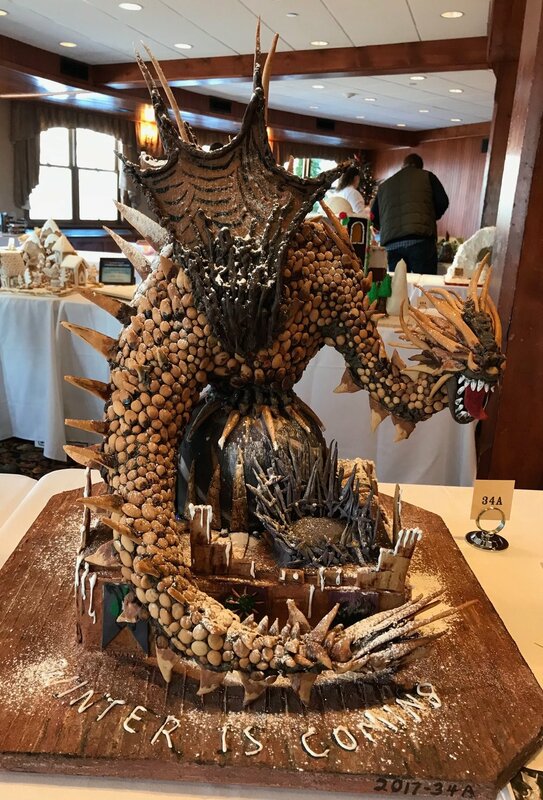 So when Nina Smiley asked if we would like to judge a gingerbread competition at the magical Mohonk Mountain House, of course we said yes! This was their second year for holding the competition, which had 3 divisions: for juniors (ages 10-17), adults (ages 18 and over), and their employees, with over 60 entries. Some guidelines were: that the entry had to be on a base up to 2 feet square, less than 2 feet high, and edible for all exposed surfaces. A key guideline was that gingerbread had to be exposed for 50% or more of the surfaces. What we discovered, as we walk around the rows of entries, was that this was way beyond ginerbread houses--it was a competition of highly artistic and imaginative gingerbread displays. 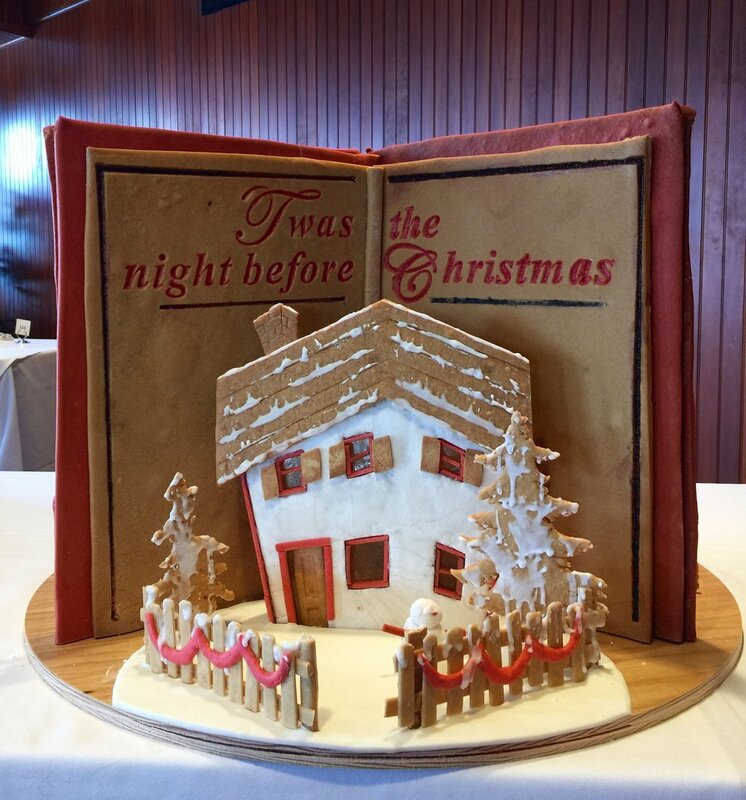 We were surprised and delighted by the imagination and ways in which the competitors used gingerbread, in both cookie and bread forms and beyond. Besides us, there were several judges including chefs, Mohonk’s own talented pastry chef, the mayor of Kingston, and others. Rose called my attention to one of the most displays by Vanessa Greeley, who had worked for years in the finance world before making a career change to run her own specialty cake decorating business. She stopped by our book signing table and Rose asked her how she came up with the amalgamation of gingerbread and chocolate, which was the composition for Mr. and Mrs. Moose. She explained that her goal was to give adequate structural support while maintaining delicious melt in the mouth quality. Clearly her analytic approach from her prior occupation came into play. We gave her high marks, for its uniqueness and precision. 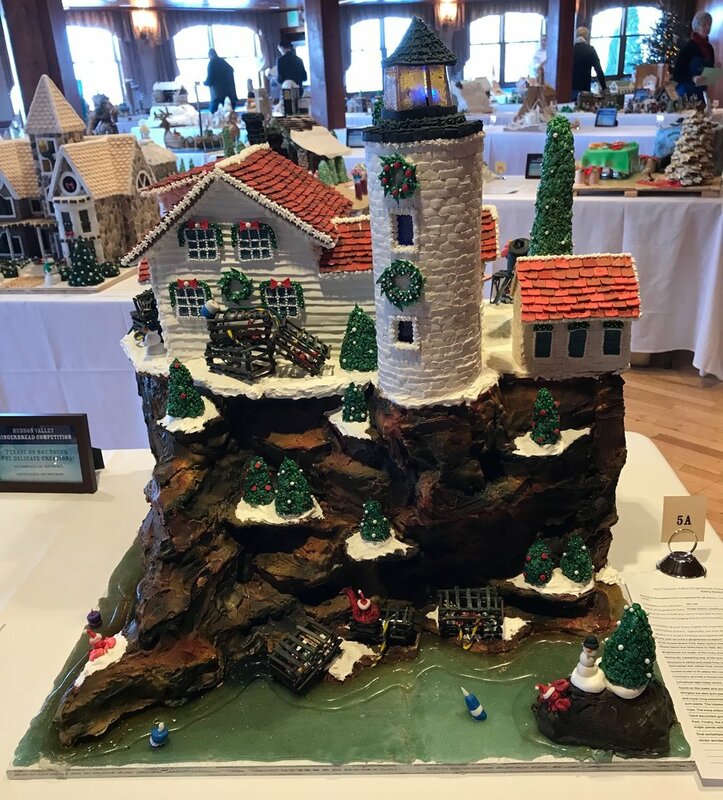 The winning gingerbread display was Flower Tower, which was sculptor Matt Maley’s first ever dive into making a gingerbread constructed display. Along with his prize from Mohonk House, Rose gave him an autographed Pie & Pastry Bible. Other works of art by their title in the order below.